Well known for their skewers and rice bowls, Grilllo is now located in Pasar Bella Suntec City ! This new urban concept stall serves good quality food with premium ingredients so you got to try! No time for meal? Grilllo got this covered! 3 convenient delivery options just for you! Grilllo is now available in UberEATS app! So if you do not have time for your meals, fret not! You may order through UberEATS now! Input special code “eats-azjoo” and get $10 off when you order for the first time! Caterspot allows you to order Grilllo for home party or company lunch! Min Spend of $50! Click Here for more info! Truffle Short Rib Bowl [$14.90] Must Try! Very tender prime short ribs topped with truffle infused soy sauce, nicely done onsen egg and sliced crispy garlic that make the entire dish an addictive one! Smoked tender chicken with runny onsen egg and grilled leek. Not that this rice bowl is bad, but I think other rice bowls are stealing limelight from this dish. The Garlic Tofu Bowl [$10.90] Must Try! Smooth silky tofu dressed in an addictive garlicky sauce, topped with crispy garlic chips , and served with onsen egg and shiitake mushrooms. The tofu is really good! Pork Belly Bowl [$12.90] Juicy slices of good quality Nagano pork served with shiitake mushrooms, onsen egg and rice. Salted egg yolk Prawns!The texture of the prawn is good but kind of lacking the distinct taste of the salted egg yolk. This , in comparison of the salted egg one, is much nicer! Its not as spicy so for those who can take a little bit of spice may try! Truffle Lotus Root Chips[$3.50] Must Try! Warning! This is very addictive ! Very crunchy and tasty! Easy to eat and its tasty! 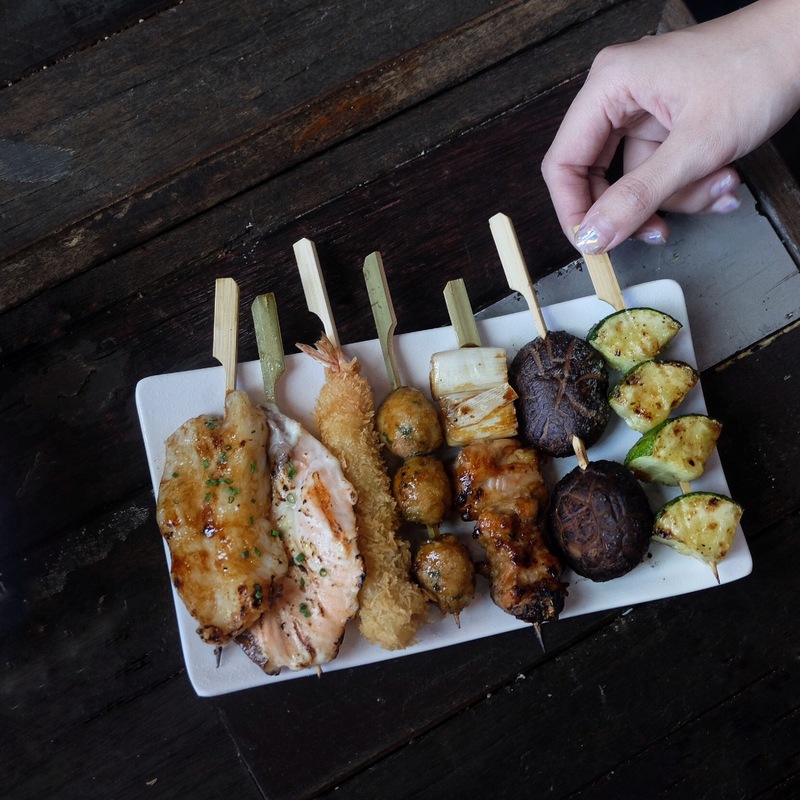 Grilllo Megapack (Combination of 20 skewers) is also available at $39.90, ideal for group sharing!